‘aving a bit of croust today, are ‘e’? Croust is the name given to a mid morning snack with the word mainly used in West Cornwall. Up country they call it Elevenses (taken around 11am) and would consist of the same as Croust – generally a slice of cake or a biscuit, although I have been known to have a homemade sausage roll for crouse, end of a pasty from the night before or one of mum’s meat patties (mini pie with beef and onion). My best memories of Croust was going up to my Papa’s (Grandfathers) and having some of my Aunt’s heavy cake and a cuppa strong tea and playing with my Papa’s crutches in the back kitchen. 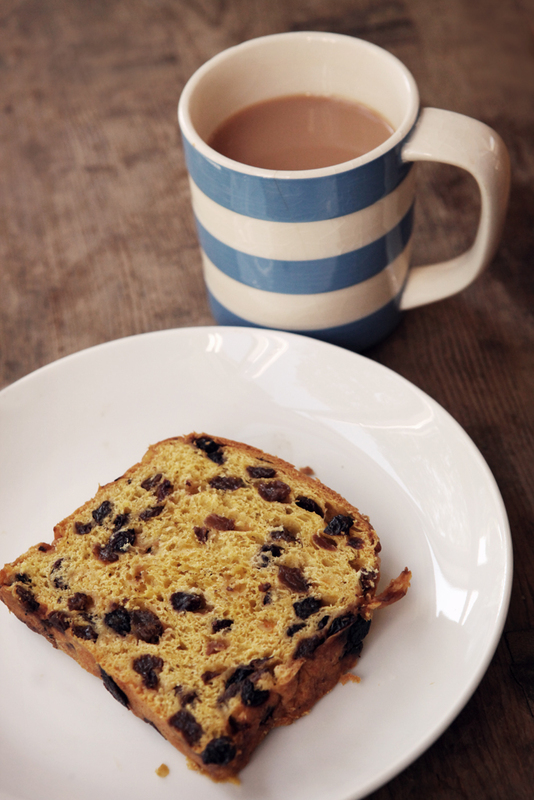 Here’s a slice of Saffron Cake from Warrens the bakers in Falmouth with a cuppa tea in my favourite mug – Cornish blue of course! Next week we will be at Mum and Dad’s and I can’t wait to be sitting in front of the Rayburn with a bit of cake and even a bit of pasty.